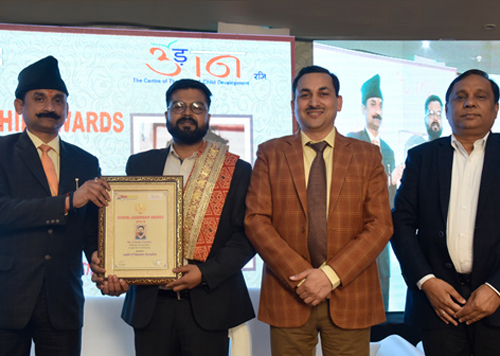 Avinash Chandra, Editor, Azadi.me was honoured with the 'Leader of Education Award 2018-19', by the news portal 'EduAdvice' and theatre group 'Udaan', on 4th March in New Delhi. The award was conferred for excellence in reporting on educational practice and policy. The ceremony was attended by noted educationists including Professor JP Saini, Vice- Chancellor, Netaji Subhas University of Technology (NSUT) and Anurag Tripathi, Secretary, Central Board of Secondary Education (CBSE), among others. 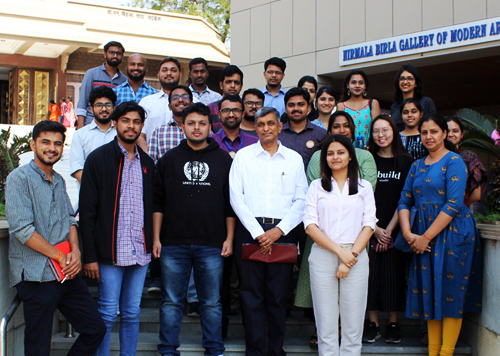 We organised Politics of Development, our two-day immersive course on the intersections of politics and policy in Hyderabad on 16-17th, March with 23 participants. With a focus on the enduring policy challenges to achieving economic development, the course engaged students in sessions like 'The Role of the State' and 'Decentralisation and Separation of Power', among others. The sessions were delivered by leading development and policy experts, including Barun Mitra, Founder and Director, Liberty Institute and Jayaprakash Narayan, Former IAS Officer and Founder, Lok Satta. The Indian School of Public Policy (ISPP) organised a workshop on 'India's Urban Future: How to make our cities inclusive, productive and sustainable' on 2nd March at the at the PHD Chamber of Commerce, New Delhi. 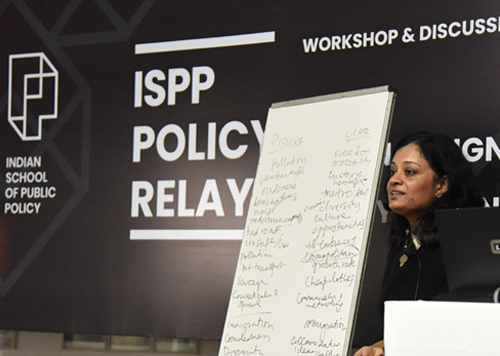 The workshop was conducted by Dr. Shahana Chattaraj, Visiting Fellow at Centre for Policy Research and addressed various urban development and policy concerns like employment, infrastructure and housing; social policy and planning. We ended the month with our monthly journalists’ dialogue, engaging six journalists on the concerns regarding the rights and recognition of street vendors evidenced by our Progress Report on Implementing the Street Vendors Act 2014. The dialogue was held at IGNCA, New Delhi, and our participants represented prominent media houses, including NDTV, Sahara TV, Rashtriya Sahara Newspaper and Ajit Samachar. The discussion was led by Avinash Chandra, Editor, Azadi.me and Vidushi Sabharwal, Senior Research Associate, CCS, and addressed the challenges faced by street vendors, the gaps in the implementation of the Act, and CCS’ on-going research and advocacy for due compliance. 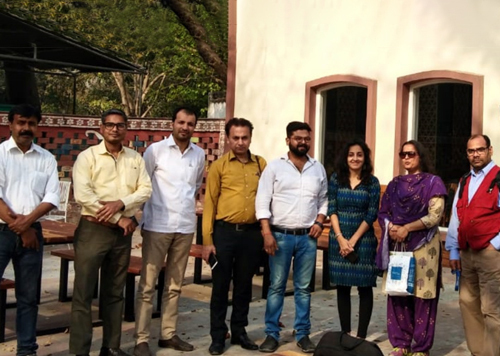 The workshop organised by ISPP on Urban Design & Policy-making with Dr. Shahana Chattaraj was featured by 12 leading media houses including Business World, Business News, Education World and The Statesmen. The Progress Report on Implementing the Street Vendors Act 2014 prepared by Centre for Civil Society was covered in the Times of India. The article highlights the lack of planning in the formation of town vending zones mandated by the Act in the state of Punjab. An article on the restrictive nature of the Agricultural Produce Market Committee (APMC) Act written by Sumbul Mashhadi, Content Associate, Centre for Civil Society for Spontaneous Order was syndicated in the National Express. The article on the viability of Minimum Support Prices for crops as a policy to mitigate farmers’ distress by Manasa Pidatala, Project Lead, Centre for Civil Society published in Spontaneous Order was syndicated in the Logical Indian. CCS offers challenging opportunities to work in a unique, high-energy and vibrant work environment. Find your fit, and join our growing team. STAY CONNECTED Signup for CCS Connect for updates about upcoming events at CCS. To avoid delivery of this e-newsletter in your SPAM / BULK folder, please add ccs@ccs.in to your address book.